Our new office is located at 3001 Spring Mill Drive, Suite F, Springfield, IL, 62704. We will be doing some work (painting and new flooring) there before we move in, so the office is not staffed at this time. Staff is still working from home and the office phone (217-698-4941) is forwarded to Lee-Ann's cell phone. 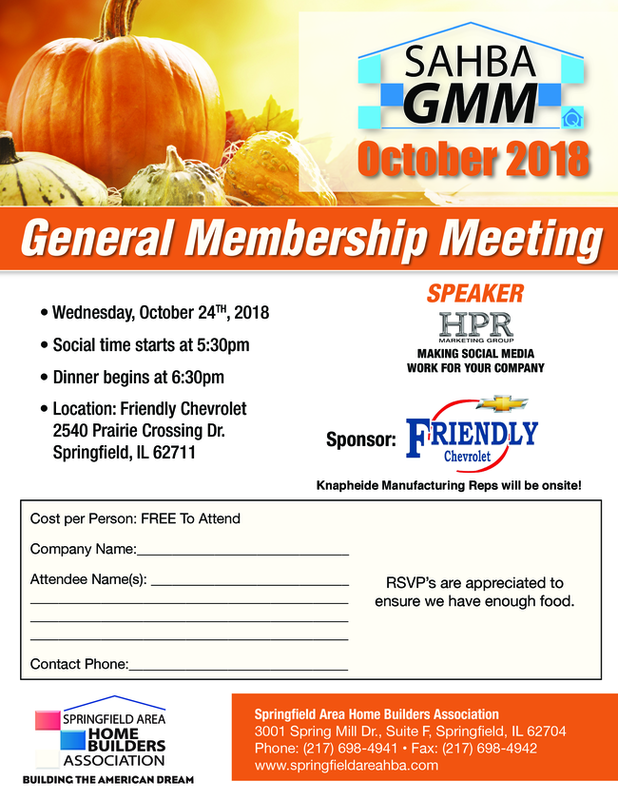 This month's General Membership Meeting will be held on Wednesday, October 24th at 5:30 pm. Our host and sponsor is Friendly Chevrolet, located at 2540 Prairie Crossing Dr. HPR Marketing will be speaking about making social media work for your company. Social time begins at 5:30 pm and dinner will be served at 6:30 pm. There is no cost to attend, but RSVP's are appreciated to plan for food. Reps from Knapheide Manufacturing will be present. SAHBA is running public-service announcements (PSAs) on local radio stations to increase community awareness of the construction-trade job opportunities that are currently available with our member s.
Member job openings are highlighted on SAHBA's website and are accessible by clicking on the text box located at the top, right-hand side of the home page. Please contact Lee-Ann about any new job announcements and we will post the openings. Thanks again to all of our shooters, sponsors and volunteers for the 2018 Sport Clay Shoot! Becky Luzinski/Illinois National Bank, Joyce Clagg/Keller Williams Realty, Janelle Dee/Connor Co and Donna Mast. Congrats to Windsor Homes who won the Top Squad! Scott Cowdry with Designed Architecture was the Top Gun - congrats! Thank you to everyone who attended the September GMM at Engrained Brewery . Our speaker was Matt Milroy, our NAHB Regional Field Rep. Thank you to Prairie Insulation for sponsoring. And check out the sunset past the brew room! Have You Made Your 2019 Home Expo Reservation? JOIN US AT THE BUILDING INDUSTRY'S PREMIER EVENT! The 2019 NAHB International Builders' Show is being held in Las Vegas from February 19th to the 21st. Registration is open for the building industry's biggest event. Exhibit attendees can professionally network while experiencing construction demonstrations, exploring new products, and learning about the hottest industry trends for less expense when they register during the month of September. Save that extra money for the Blackjack and craps tables. The Hybrid Home Network: Avoiding the ˜Spinning Beachball of Death"